Mountain Escapes offers a wide variety of rental cabins in the Ocoee River and Blue Ridge Mountains in the North Georgia region. Each one is independently owned and totally unique. Browse our cabin categories below to find the North Georgia vacation rental that best suits your needs. Then, use our local area guide to start planning your Blue Ridge activities and adventures! One bedroom cabins - some with a loft or sleeper sofa. Two bedroom cabins - many with loft bedrooms or sleeper sofas to increase the sleeping capacity. 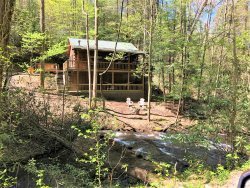 Three bedroom cabins in north Georgia and the Ocoee river area. We also have cabins that serve the Blue Ridge and Toccoa river areas. Four or more bedroom cabins in the Blue Ridge and Toccoa River areas. We also have rental properties that serve the surrounding north Georgia and Ocoee river areas. Harrahs Cherokee Valley River Casino is now open! We have vacation rentals located just a quick twenty to forty minutes from the brand-new gaming, food venues, cocktails and great entertainment. Hotel space is limited at the casino. Why stay in a tiny hotel room when you can book a cabin! Raft the wild Ocoee River, hike or mountain bike the Tanasi Trail system by day and spend the evening taking advantage of what the casino night life. Free Ocoee River Whitewater rafting and zipline trips for our cabin rental guests. Other activities activities available as well. Mountain Escapes has cabins closest to Ocoee River whitewater rafting, with most cabin rentals within 30 minutes of the nearest rafting outfitters. The rafting outfitters are located on both the east and west ends of the river. Most of our cabins are closer to the east end of the river, however we do have one property near the west end. East end outfitters are in Copperhill, Turtletown or Ducktown, TN or McCaysville, Blue Ridge, Mineral Bluff, Epworth, GA. The western companies will be in Ocoee, Benton, or Cleveland, TN. Give us a call, and we will be happy assist you in choosing a cabin and whitewater rafting company for your trip. These cabins are near the Ocoee Whitewater Center - starting point of the Cohutta 100 & Big Frog 65. Ask about discounts! Cabins with outdoor fire pits. Note that fire wood is not included in the nightly rate. Bring your own or we can deliver an ample supply for a weekend stay for $35. You will need to provide your own starter log or kindling. We need at least 48 hours notice for delivery. From large five bedroom cabins to cozy studio getaways, we have properties of all shapes and sizes with beautiful mountain views. These mountain-view cabins in Blue Ridge are close to all sorts of outdoor activities - the Blue Ridge Scenic railroad, horseback riding, mountain biking, canopy tours and more. Mountain Escapes has a wide variety of pet-friendly cabins in North Georgia, Blue Ridge, as well as pet-friendly cabins near the Ocoee River. Almost half of our vacation rental inventory of properties are pet friendly. Many of the shops and restaurants in downtown Blue Ridge welcome pets. The City of Blue Ridge even hosts a festival called "Paws in the Park" every year. So when you are looking for Pet friendly cabins in north Georgia, Blue Ridge, or near the Ocoee River keep us in mind here at Mountain Escapes Property management for your weekend getaway or week long vacation. Check out our weekly rates too. You can stay seven night but only have to pay for five nights on almost all of our cabins. We are also looking to add more Pet friendly cabins in north Georgia, Blue Ridge, and near the Ocoee River to our vacation cabin rental program, so if you are looking to buy an investment property to put on a rental program or already have a pet friendly vacation rental and in the market for a management company, then give us a call. ***Please understand that these cabins allow pets but there is an additional cleaning fee of $35. This does not cover any damage or "accidents" they may have. We also ask that you crate your pets anytime you leave the property in the event we have to send someone over like maintenance personnel. Weve temporarily lowered prices on some cabins. Book Before the Price Goes Back Up!! These cabins have water of some persuasion on-site or access: Creek, River, Lake, Pond, Stream etc.